“I was baffled when I saw the initial data for iPTF16geu from the Palomar Observatory. It looked like a normal Type Ia supernova but it was much brighter than it should have been given its distance from us. The rapid follow up with more powerful facilities confirmed that we had stumbled upon an extremely interesting and rare event,” says coauthor Mansi Kasliwal, an assistant professor of astronomy at Caltech. An international team of astronomers has, for the first time, seen a cosmic magnification of the light from a class of supernova called Type Ia. Type Ia supernovas — often referred to as “standard candles” because of their well-known intrinsic brightness — are frequently used by astronomers to accurately measure the expansion rate of our universe, as well as the amount of dark energy, which is thought to be accelerating this expansion. 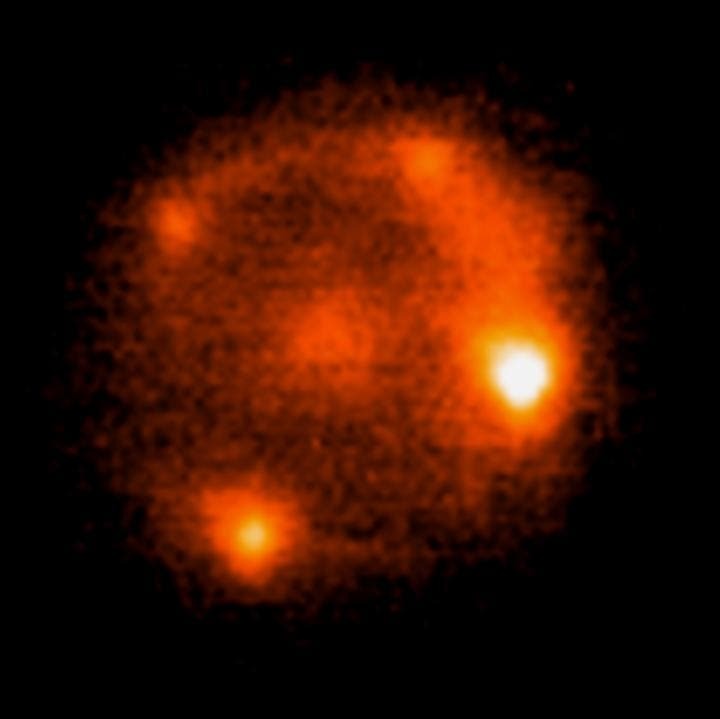 Within two months of detection, the team observed the iPTF16geu supernova with the NASA/ESA Hubble Space Telescope; the adaptive-optics instruments on the W.M. Keck Observatory atop Mauna Kea, Hawaii; and the VLT telescopes in Chile. Apart from producing a striking visual effect, capturing the image of a strongly lensed Type Ia supernova such as iPTF16geu is extremely useful scientifically. Astronomers can measure very accurately how much time it takes for the light from each of the multiple images of the supernova to reach us. The difference in the time of arrival can then be used to estimate with a high precision the expansion rate of the universe, known as the Hubble Constant. Another unique advantage of lensed Type Ia supernovas is that they can be identified with relatively small telescopes, such as the 48-inch Samuel Oschin Telescope at Palomar Observatory, which was used to image the iPTF16geu supernova. Larger telescopes are in high demand, and equipped with narrow-field cameras that take too much time to routinely scan the sky. The iPTF project scanned one-fifteenth of the visible sky every night. Its successor, the Zwicky Transient Facility (ZTF), set to begin observing this summer, will scan the skies even faster, and is capable of covering the entire accessible sky every night. By scanning large swaths of the sky, astronomers can sift through thousands of cosmic objects to find rare events such as the lensing of a Type Ia supernova.